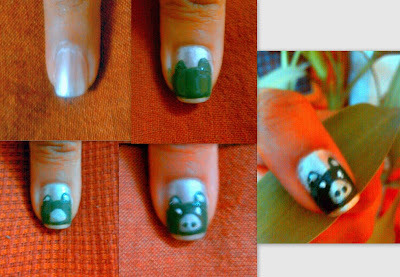 Who doesn't love a teddy bear, how about having it on your nail. Girls do try this, it looks difficult but very simple. You can try out this with different shades but use a combination of contrast colours. Hi Guys, here i come with a beautiful creature on earth "Butterflies" on nails.Check out the tutorial and do try it. Step 2: Allow your base color to dry, take a black color nail polish and draw butterfly with zero size brush. Hi all, i believe its not necessary to be accurate or gud at nail art, even a good combination of colours can make a simple art look beautiful. Friends today i came up with a pearl white and green colour combination.White pearl that gives a glazy look and green on it enhances it. I have used white pearl as base and a thin brush for making green checks in it.